UPDATE: Decided to uninstall PunchTab from Vervely at this time (Feb 2014). If you have ever used applications like Foursquare, Get Glue, or Nike+ Running App, then you would have experienced examples of gamification. Basically, gamification converts non-gaming activities like going for a jog, leaving comments, Tweeting, visiting a restaurant, taking a test, watching a video, reading a lesson, etc into gaming activities by using different concepts like points system, leaderboards, badges, and awards. When used properly by a brand or an organisation, gamification can help to encourage deep and regular engagement with users and members. That’s why there a lot of useful applications of gamification for nonprofits, charities, associations, businesses, and education, amongst others. And right now, there are more and more tools and services make gamification doable in web presences, campaigns, and other similar situations. Some are available for free and others are for a fee. I would like to explore this topic more in future posts. For now, though, I would like to focus on one of Vervely’s current experiments in gamification using the PunchTab service. 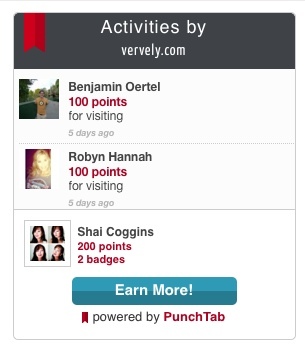 Vervely’s PunchTab Badges – Have you got yours yet? This is where you can unlock and earn badges and points by completing certain actions on the site. The very first badge you’ll earn is the bike badge and it awards you 100 points. But, in order to start unlocking badges, you need to “sign up” via email or using your Facebook account. The Loyalty Rewards panel is at the bottom of the screen. Here, you can have access to your dashboard too and gain points by Tweeting, adding to G+, or Liking the post. After you achieve a certain number of points, you can exchange these points for these gift cards. They currently have one for Starbucks, Barnes & Noble, Groupon, and Restaurant.com. These are the standard rewards that come with every free account at PunchTab. If you want to upgrade, you can get more features like customised rewards that you can offer your users and members. Currently, Vervely is only using the free version. PunchTab also offers a way for you to run your own giveaways. 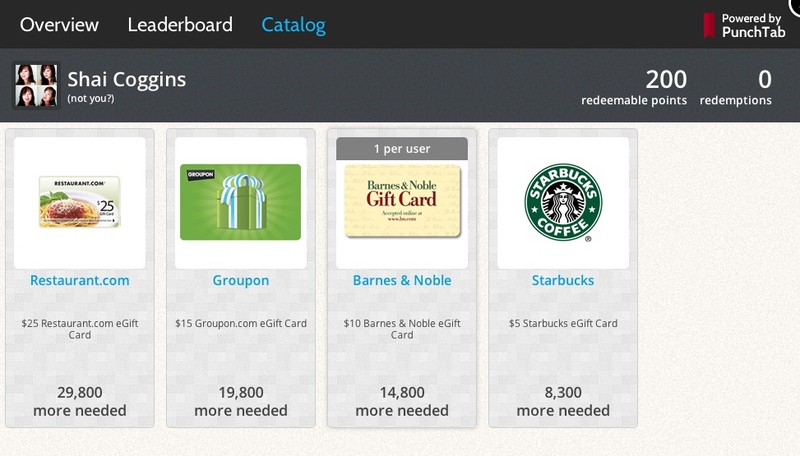 It also utilises gamification in the giveaway by allowing points systems, etc. The tool also enables you to use social media platforms like Twitter, Facebook, and Pinterest. At the moment, I’m looking at doing a test run on this with our first ever giveaway here at Vervely one of these days. So, do watch out for announcements. There are a couple of things that I’m not liking with PunchTab at the moment (such as, not being able to exclude admins in the Leaderboard right now and incompatibilities with some browsers). But, I am still planning on using PunchTab here on Vervely to see if folks would take to it. If we have enough folks using and playing with this, I might even consider expanding its use. We’ll see how it goes. How about you? What do you think of PunchTab? Do you use gamification in year organisation? How? On top of our in-house experiment, Vervely is currently working on a couple of projects that uses gamification as part of its strategy. If you would like Vervely to help you to incorporate gamification in your campaigns and activities, do let us know. We’d love to see if we can help!